Over 25 years of experience in video hardware and software design have rendered GVS a most insightful and versatile partner for sophisticated VTR/DDR, Storage, Server, and Controller productions. GVS’s high-quality products and solutions meet the individual requirements of a broad spectrum of clients including broadcasting corporations, film and TV productions, R&D departments of universities and companies active in medicine, aviation, security and defense. The products are comprised of customized devices as well as proprietary developments and range from single items to large productions manufactured in a most cost effective manner. With its latest development, the “Smallest True HD Camera”, GVS has managed to enclose state-of-the-art video quality in an ultra-compact housing perfect for action animated live programs and high-quality movie applications. With native RAW HD SDI out put at rate of 1.4Gbit/sec, pixel to pixel accuracy without any compression. • Supports full bandwidth 4:2:2 10-bits (12-bit capable) for 1080p, and 720p formats. • 4:2:2 formats for single link SD/HD-SDI output. The world of HD expanded into the industrial imaging arena with the debut of GVS’s first HD camera, the GVCAM Pro+. Now, continuing its commitment to HD picture quality for applications that require dynamic high-resolution images while remaining flexible, GVS introduces the GVCAM Pro+. The stunning new model extends application possibilities by incorporating a new Day/Night function that enables the camera to capture high-quality, HD SCI RAW color, pixel to pixel images during the day and clear, black-and-white images at night. 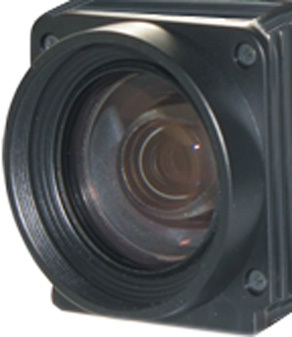 In addition, the GVCAM Pro+ achieves a minimum illumination of 1.4 lx (F1.6, 50%) by dynamically removing the infrared cut filter and allowing the spectral responsive range to extend into the near infrared. The GVCAM Pro+ incorporates a 1/3-type HD CMOS image sensor boasting approximately two million effective pixels, and provides a 16x9 aspect ratio, making it ideal for use with wide-screen displays. This camera also features multi-format video outputs, satisfying user needs for high-definition HD and standard -definition SD in SDI, Analog and Fibre optics output directly from the camera. These three different interface modes are the only difference among the GVCAM Pro+ models. The NR (Noise Reduction) function removes noise (both random and non-random) to provide clearer images. This function has six steps: levels 1 to 5, plus off. The NR effect is applied in levels based on the gain, and this setting value determines the limit of the effect. In bright conditions, changing the NR level will not have an effect. In this mode, higher sensitivity gain is applied as standard gain increases, reaching a gain level at MAX gain of up to 4x the standard gain. In such cases, however, there will be a high volume noise in the image. The Wide Dynamic Range mode is a function for dividing an image into several blocks and correcting blocked-up shadows and blown-out highlights in accordance with the intensity difference. It enables you to obtain images in which portions ranging from dark to light can be recognized, even when capturing a subject with a large intensity difference that is backlit or includes extremely light portions. Images with wide dynamic range are produced by combining long-exposure signals (normal shutter) with the signals of the high-intensity portions obtained with a short exposure (high-speed shutter). A variety of AE functions are available for optimal output of subjects in lighting conditions that range from low to high. The gain limit can be set at the Full Auto, Shutter Priority, Iris Priority, Bright, Spot Exposure and Manual in the AE mode. Use this setting when image signal-to-noise ratio is particularly important. The shutter speed can be set freely by the user to a total of 22 steps – 16 high speeds and 6 low speeds. When the slow shutter is set, the speed can be 1/30s, 1/15s, 1/8s, 1/4s, 1/2s, 1/1s. The picture output is read at a normal rate from the memory. The memory is updated at a low rate from the CCD. AF capability is low. In high speed mode, the shutter speed can be set up to 1/10,000s. The iris and gain are set automatically, according to the brightness of the subject. When extremely clear, super picture quality HD images are required, the GVCAM Pro+ offers 1080p and 720p signals. This versatile and flexible camera can also be used with an SD system to allow easy migration from SD to HD. The GVCAM Pro+ is designed with a multitude of functions. With a 240x zooming capability, Picture Freeze function, SPORT AE function, and Slow Shutter, the GVCAM Pro+ is ideal for applications such as TV Broadcast, Video Conferencing, Inspection, Cable TV Broadcasting, Point-of-view (POV), Defense, Deep Sea, Medical, and Extended Shooting. Furthermore, with the incorporation of the Day/Night function, which is essential for monitoring, this camera is a great choice for a wide range of Security, and high quality Surveillance applications. Full Screen On: Ability to have full pixel to pixel video source on SD/HD-SDI. Standard Sync: Programmed to VBS: 1.0 Vp-p (sync negative) Y/C.